In the past, if you had a tooth with a diseased nerve, you would probably lose that tooth. Today, with a special dental procedure called root canal treatment, your tooth can be saved. Root canals are a relatively simple procedure with todays advanced technology and are mostly painless. Best of all, having a root canal when necessary can save your tooth and your smile! When a tooth is cracked or has a deep cavity, bacteria can enter the pulp tissue and germs can cause an infection inside the tooth. If left untreated, an abscess may form. If the infected tissue is not removed, pain and swelling can result. This can not only injure your jawbones, but it is detrimental to your overall health. Without the proper treatment, your tooth may have to be removed. Root canal treatment is not painful. Your tooth is numbed well and you will feel nothing. Afterwards you may find that all of your pain from your infected tooth is gone. Root canal treatment involves one visit. 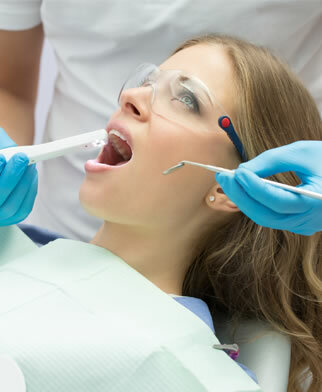 During treatment, your general dentist or endodontist (a dentist who specializes in problems with the nerves of the teeth) removes the affected tissue. Next, the interior of the tooth will be cleaned and sealed. Finally, the tooth is filled with a dental composite. If your tooth had extensive decay, your doctor may suggest placing a crown to strengthen and protect the tooth from breakage. As long as you continue to care for your teeth and gums with regular brushing, flossing, and checkups, your restored tooth can last a lifetime.